Roof trusses come in more than just one style. Vaulted, cantilever, queen, fink, and gambrel roof trusses only name but a few. Usually roof trusses are constructed in a factory and shipped to a job site, but occasionally roof trusses are built on site by the builder. 75% of all news homes are built with trusses, leaving 25% of roofs conventionally constructed. Roof trusses come with advantages. They are quicker to build, use less lumber, and require less man-power. 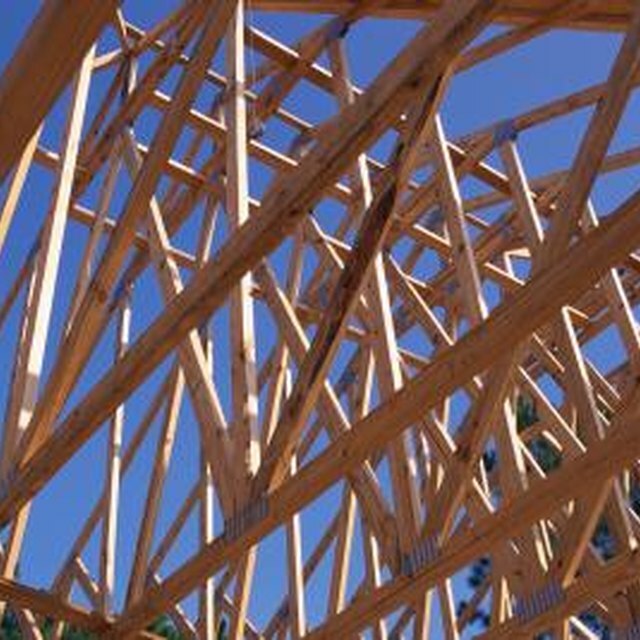 If you are considering framing your own roof trusses, yet you are not quite sure how it is done, read through the following steps. Determine the span, the rise, and pitch of your roof. This will determine the type of truss you will frame. Purchase 2-by-4 material in southern pine, Douglas fir, or spruce-pine-fir. You will need a bottom chord which runs the length of the roof, two top chords, equal length, which meet in the center at the peak, and the webs which add support. Cut the 2-by boards to the right length and make all angle cuts. Trusses are strong because they are made from a series of triangles considered a strong and stable shape. Lay out your chords and webs on the ground. You will frame the truss laying down and lift it to the roof when you are through. Properly angle the top chords at the ends of the bottom chord. Attach each side with a gusset. This is a metal bracket with teeth for fastening boards together without using nails. You can also make your own with small squares of wood. These are nailed onto both pieces of wood, tying them together. Attach a gusset to the peak where the two top chords meet. In the center of each top chord attach a web with gussets that connects to the bottom chord diving it into thirds. Install the last two webs starting at the center peak and extending down to where they meet the webs already installed.